I write because I wrote rebelliously upon leaving home—no punctuation, no caps, no care to the rightness of my writing. That evening, in a random notebook in my cousin’s apartment where I had sought solace and shelter from the storm of being seventeen, uneducated, and alone—I discovered that I loved putting my thoughts and feelings onto the page. That I finally had someone to dance with, that I was whole and connected. My hands holding pen and paper were busy for the first time in a literary endeavor. I write because I have read and do read, and the beauty of a line or phrase causes me and has caused me such happiness at times, deep and fully visceral from my inner core, my spine, to the farthest edges of my aura, I am pleased with beautiful word sculptures. I write because my father had books and I was first recognized as a child for being able to read adult poetry from his books “as if she knows what it’s talking about”: a marvel from my mother. I write because my father, moving us from town to town to seek his fortunes, left behind bikes and dolls but his books always arrived in boxes, and we were allowed to play with some of them as if they were building blocks. My only dollhouse for my imaginary doll was built out of my father’s books. As soon as I could read them I did, and he gave me full permission to read whatever I could read, and then to make sure I was reading them, he decided to pay me for writing books reports for him. My first job as a writer, I guess, and I was fourteen or so and bored, as we had just moved again and left my last group of friends. I was alone a lot and he wanted to give me something, and that gift was to read his books and to write about them a bit even though I surely did not understand much of what I read. I understood the beauty of a sentence. I write because I want to capture my life in fine sentences, to honor my living, to share it with others maybe. 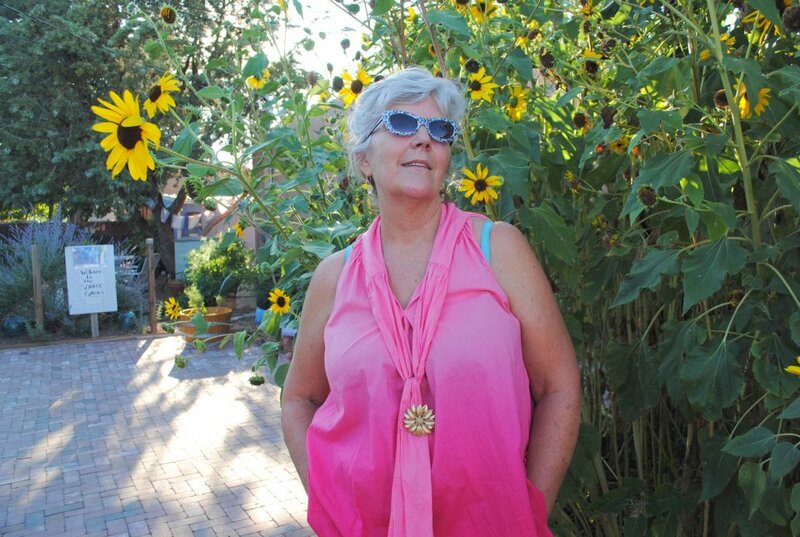 BIO: Merimée is 66 yrs old, still teaching a writing class, really did the drop out and hippie thing on the Coast and in Taos ten years, then here [in Albuquerque] for school. MA in CW. Four kids, four g-kids. Arrived in El Rito, NM in 1970 with a bunch of druggie Vietnam vets–took it from there; never went back to live in the NW again. Likes sun. EDITOR’S NOTE: Merimée is also the co-host of Duke City DimeStories, a monthly open mic series for PROSE.